Probate is one of those legal terms that tends to confuse non-lawyers. You’ll often hear the word “probate” used as a noun, a verb, or an adjective at different times. For example, you might catch an attorney mentioning “a probate estate,” or you may hear a friend talk about “probating a will” after a parent passes away. So what is “probate”? In general, a good definition of probate that encompasses and makes sense of all these different uses of the word would be as follows: probate is the legal process of proving that a deceased person’s will (if they have one) is valid and then processing their estate through the legal system. When we say “processing an estate,” that involves two steps: paying the decedent’s debts and then transferring any remaining assets to their beneficiaries. Another term for probate you may hear that means essentially the same thing is “estate administration.” People sometimes use this term to refer specifically to the process of probate for a deceased person who didn’t leave a will (mainly because a court-appointed person who oversees a probate estate with no will is called an “estate administrator”), but don’t let this confuse you — “probate” and “estate administration” are interchangeable for most purposes. Do All Assets Have to Pass Through Probate? The probate process in Maryland doesn’t necessarily apply to every asset in a deceased person’s estate. The term for the part of an estate that has to go through probate is called the “probate estate,” and it includes assets that the person owned by themselves. Assets that a deceased person owned jointly with someone else or that are designed to pass to a surviving beneficiary automatically — like a life insurance policy or a retirement account — are considered “non-probate assets” and will pass to the surviving owners or beneficiaries without going through probate. There are two kinds of probate in Maryland that have different legal venues associated with them. The venue where your probate case will be handled depends on whether or not anyone contests the deceased person’s will. Administrative probate is for uncontested wills. These cases are handled by the Maryland Register of Wills. Judicial probate is for contested wills. The Maryland Orphan’s Court, which is the state’s probate court, handles these cases. Regardless of whether your estate has to go through administrative or judicial probate, the steps of the process remain similar. The primary difference is that judicial probate can be a much longer process since the court has to settle the dispute over the will in addition to all of the other concerns and procedures that go into probate. In some cases, fighting over a will can cause a judicial probate case to drag on for years. 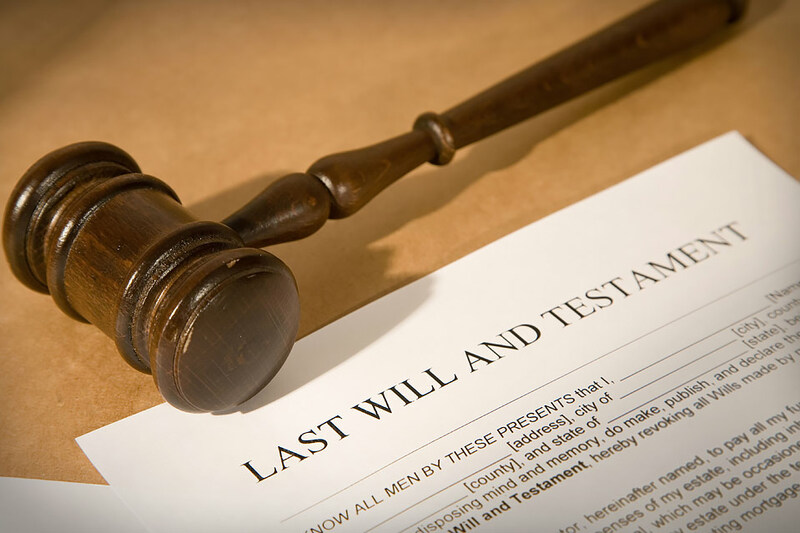 Locate the deceased person’s will (if one exists) and determine who it names as the estate’s personal representative. This is the person who will oversee the estate during the probate process. If the deceased person didn’t leave a will, someone will need to petition the court to serve as the estate’s representative or the court will appoint an estate administrator. Personal representatives can be sued and held individually liable for mistakes made during the probate process, so it’s very important to contact an experienced probate attorney if you’re planning to act as the personal representative for an estate. Create an inventory of the deceased person’s property and determine whether the estate in question is a small estate or regular estate according to Maryland Law. A small estate is one that has a value of less than $50,000 (or less than $100,000 if the surviving spouse is the sole beneficiary). Estates must pass through either the Register of Wills or the Orphan’s Court, or they can sometimes be settled through a simpler process known as Modified Administration. Petition the Maryland Register of Wills to begin the probate process. This will require your attorney to fill out and file a set of forms with the Office of the Register of Wills. Prove the will in court. This usually requires testimony from adult witnesses who saw the deceased person sign the will, unless the decedent worked with an attorney to create a self-proving will. Pay the deceased person’s debts and expenses. This includes filing tax returns and paying taxes, both for the estate and the deceased person. Distribute the deceased person’s property according to the terms specified in their will. Once the decedent’s property has been distributed, a waiting period begins during which creditors and other parties have a last chance to raise objections. This period usually lasts for six months. Once this window passes, the probate process will officially end and the court will consider the estate closed. Keep in mind that this is just a simplified and streamlined overview of the probate process. The actual probate procedure involves a great deal of paperwork and includes many additional smaller steps along the way. Understanding the process in great detail would require reading an enormous legal text cover-to-cover, which is exactly why you should work with an experienced estate attorney if you’re preparing to act as a personal representative for a loved one’s estate. If someone has named you as the personal representative of their estate or if you’ve volunteered to act as such and are seeking legal counsel, please contact the Parkville offices of Pinder Plotkin today at (410) 661-9440. Our attorneys have years of experience in all areas of Maryland estate administration (including wealth management, asset distribution, and probate proceedings), and we’ll give your probate case the careful attention to detail and professional treatment it deserves. Complete our convenient online contact form today to learn how we can help you manage your loved one’s estate and protect you from liability.